2 LOVELY Spacious 3 bedroom Townhouses NEXT door to each other. 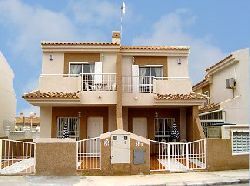 Each sleeps up to 6 or 13 for both.Can be rented TOGETHER or SEPARATELY .Car NOT essential Central Location.Close to Blue Flag Beaches GOLF Restaurants Supermarkets Bars Etc. Lovely Large Immaculate pool[with kids section]in gardens with Palm trees .OverLOOKED by our SOUTH facing patio[photo WAS taken from our Patio]shared. Children can be safely watched from our Patio while you enjoy a drink or Two. The Lovely SOUTH facing Patio is furnished with Large table 6 chairs, Sunloungers, parasols, BBQ. [Great for an evening BBQ or Late night swim]. Easy access. 5 mins Drive to Award Winning BLUE flag BEACHES.Central location - car NOT essential. Supermarkets Restaurants ,Bars, Banks, etc 5 mins walk. Close to BLUE FLAG Award winning beaches,Marinas ,Aquapark Famous Salt Lakes. Restaurants, bars, shops & GOLF courses.Terra Mittica Theme Park. ALICANTE & Murcia (San Javier) airports 30 mins. Bedrooms: 3, Sleeping maximum of 8 people in EACH house 16 in total. The main bedroom is Spacious & Light double room with patio doors leading to balcony [with table and chairs]Great for a leisurely coffee watching the sun rise. Double Bed, Large wardrobe, Drawers, Bedside tables, & Lamps. Long Mirror, Hairdryer, SAFE fitted ,Ceiling fan. 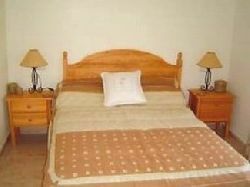 There is a Lovely SUNNY twin bedded room with south facing window which overlooks the pool& Gdns. Sleeps 8 in total,in each house 16 in BOTH. 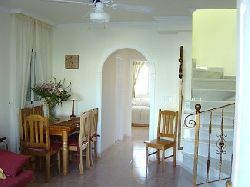 1 Spacious tiled family bathroom with shower bath toilet lighted mirror and bidet Toilet power points, upstairs. There is a convenient toilet with basin & lighted mirror power points downstairs. Lovely and bright Spacious Lounge area with Extendable table , 6 chairs,Large wall unit. Full sized sofa, 2 additional chairs,SKY television [20 English channels), CD Hi-Fi Dvd [with a selection of dvd & cds]Mirror, coffee tables ,table lamps,Lovely Marble staircase leading to upstairs. Separate fully equipped kitchen with granite worktops Cooker ,Hob ,Fridgefreezer, Microwave, Kettle ,Toaster,Separate utility area with washing machine. Upstairs furnished balcony. Downstairs Off street parking. Patio areas at front and back . SOUTH facing (overlooking pool). Patio furniture (table, chairs, sun-loungers, umbrellas BBQ) on balcony and both patios. Ceiling Fans in all rooms, Electric Radiators>Off Street Parking. CAR NOT essential. Central Location. 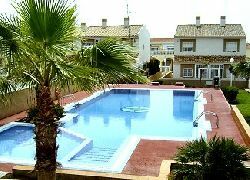 Close to ALICANTE & Murcia [30 mins] Airport pickups arranged. Children welcome. COT & high chair supplied.The houses are very child friendly with kids section in the POOL, The pool cannot be accessed except through a pool gate which is kept locked [key supplied] So you know there Safe.You can see them clearly from the patio area [the photo was taken from our patio. Blue Flag award winning BEACHES very close,Aquapark . Fun fair, theme parks (Terra Mitica),Championship GOLF ,New LARGE Shopping Mall. sailing, fishing & riding Windsurfing all Nearby. Famous Salt Lakes and Nature Park. Largest street market in Europe every Friday. The fact that the two houses are together means that effectively 16 people can holiday together. The downstairs bedroom and toilet are suitable for the less mobile. the kitchen is separate from the living room - often they are not. The pool is LOVELY with Palm trees and grassed area It is very child friendly and has a childrens section. The area around is fully established (not a building site)It is in a lovely quiet residential area but is close to everything.. There are 3 supermarkets Irish English & Spanish Bars restaurants Banks etc 5 mins walk. ALICANTE & Murcia airports are 30 mins away and airport pickups can be arranged.